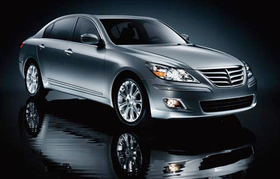 The 2009 Hyundai Genesis, which won car of the year honors at this year's Detroit auto show, proved to be an all-round hit. The Hyundai Genesis ranked as the most smoothly launched vehicle in a U.S. study that grades automakers on their ability to hit sales, price and dealer-profit targets with new models. The 2009 Genesis scored 689 out of 1,000 possible points on J.D. Power and Associates newly created Vehicle Launch Index. The worst performer: The 2009 Toyota Matrix. It scored 439 on a scale that measures sales volume, vehicle design, quality, the need for sales incentives, dealer inventory levels, and dealer gross profits. Following the Genesis were the Ford F-150 pickup and the Volkswagen Tiguan. The Matrix, the Dodge Ram pickup and the Pontiac Vibe -- General Motors now-abandoned twin version of the Matrix -- were rated as the worst introductions last year. The 2008 launch of the Matrix was complicated by quality issues, unappealing design and higher-than-average incentives in its segment, according to J.D. Power. How well a new model sells is only one part of the equation for judging how well a vehicle launch has gone, said Gary Dilts, a senior vice president at J.D. Power. The other questions are: Is it selling at the level that was forecast? Is it selling at the expected price point? Is it holding its value in the market? Are dealers making the expected margin on it? Is it causing the manufacturer to spend more than planned on marketing support? J.D. Power estimates that automakers will spend $50 billion to launch 205 new and redesigned vehicles over the next four years. Dilts called the Hyundai Genesis launch flawless because of its success in hitting planned price levels and sales numbers. The new F-150 launch succeeded thanks to Ford Motor Co.s decision to delay the introduction until dealers could sell off inventories of 2008 models, Dilts said. By clearing the runway, the F-150 was able to sell as planned, he said. By comparison, Dodges Ram pickup was introduced amid large inventories of unsold 2008 Rams. The oversupply resulted in the Ram carrying incentives of $7,500. Dilts suggested that the primary cause for a poor launch is a companys failure to honestly consider the impact of competitors models. Other contributors to a poor launch are product quality problems, low brand image and unappealing design.